I have mentioned the upcoming exhibition of the work of Margaret Rope at Shrewsbury Museum and Art Gallery on these pages before, and I was pleased to be able to attend the private view for the exhibition on 9 September. This innovative exhibition includes drawings, cartoons and projections of many of her windows, as well as work in glass and sculpture. 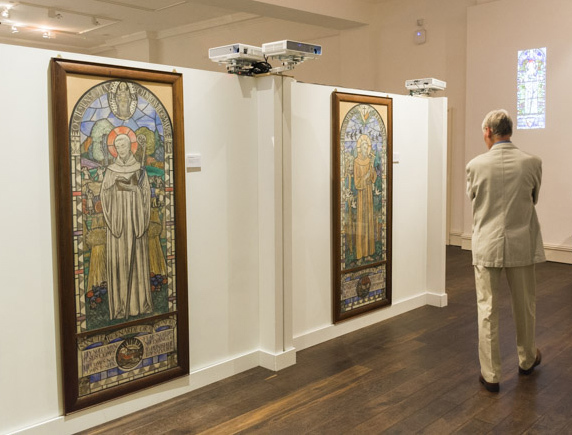 The exhibition includes coloured cartoons of all three of her windows in Wales, the pair of saints at Llanarth in Monmouthshire and the memorial window to her niece and nephew at Llandovery, who both died in childhood. This exhibition view shows the Llanarth cartoons with (just visible!) my photograph of St Bernard projected on the wall. 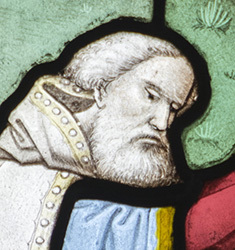 Also at the exhibition is a cartoon of the window depicting St Winifrede at the Church of St Peter and St Paul, Newport, Shropshire, which found its way to the museum at Holywell at some stage in the past, and has been lent by the Diocese of Wrexham. 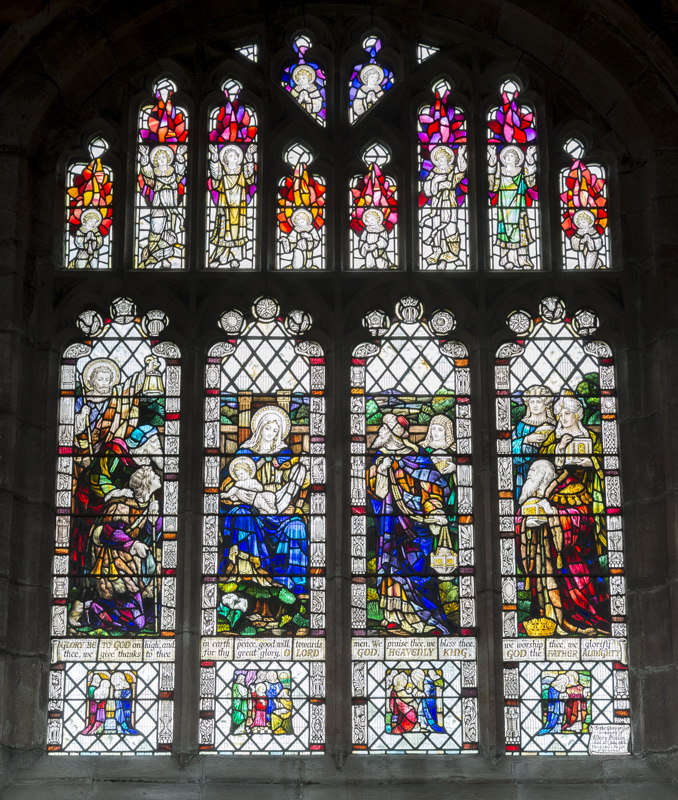 I also took the opportunity to visit Shrewsbury Cathedral, where there are seven windows by Margaret Rope. and I will post a further piece about the imagery of Winifrede on the Saints in Wales project website. I will be back in Shrewsbury, on the 17 November, if not before, to give a talk about David Evans, another important artist with Shrewsbury connections, for the Friends of Shrewsbury Museum. The exhibition continues until 15 January 2017. 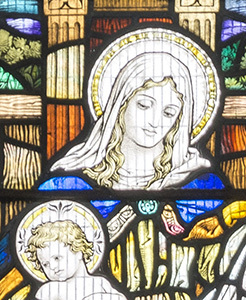 The new window by Helen Whittaker for Abergavenny is described, with some justification, as ‘one of the greatest new works of church art in Wales since the Second World War’ on the Church in Wales website. 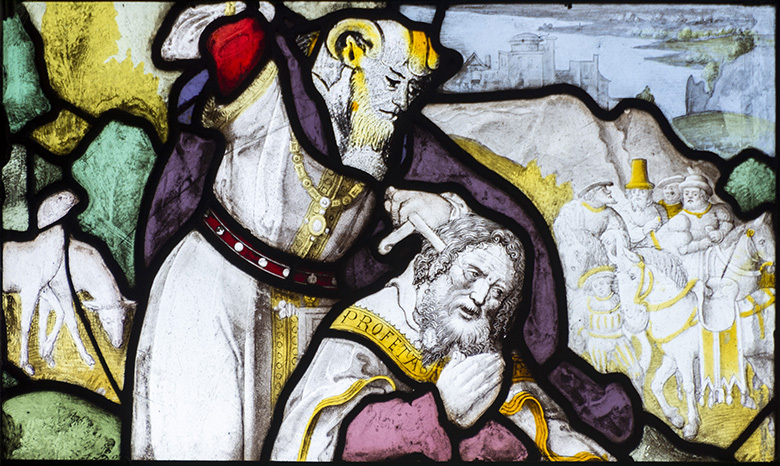 A crowned figure at York Minster dating to the mid-twelfth century is sometimes described as the earliest surviving painted panel of window glass in Britain, and probably came from a Jesse window. Other important medieval survivals include the later Jesse windows at York and Wells, as well as the most complete medieval window in Wales, at Llanrhaeadr-yng-Nghinmeirch, dating from 1533. But the subject is still returned to. 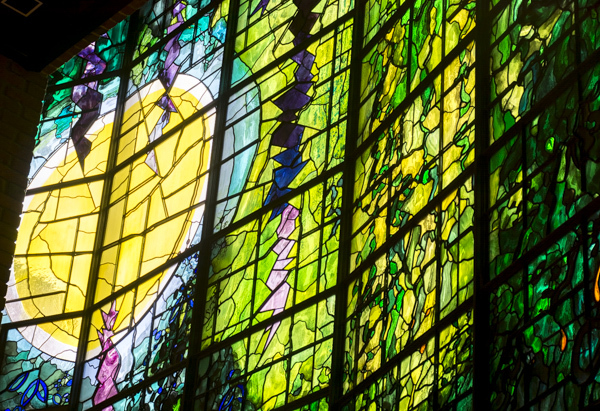 The big east window of the Lady Chapel at Llandaff Cathedral also features the Tree of Jesse, and since it was made by Geoffrey Webb in 1951, it might also claim to be one of the most important commissions for church art in Wales. 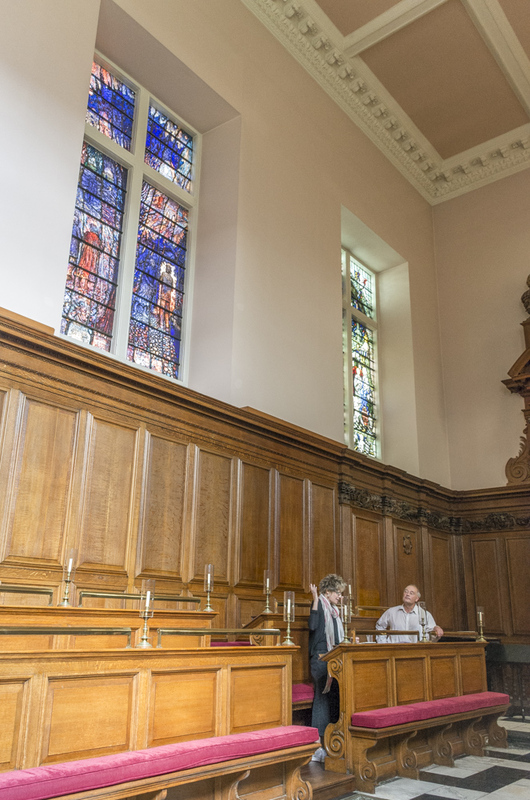 But in truth, there are plenty of others to choose from, such as Jacob Epstein’s Majestas in Llandaff, and other outstanding windows on the same scale or of the highest quality, but they are just not so well known. The new window will be dedicated on 7 July by the Bishop of Monmouth. 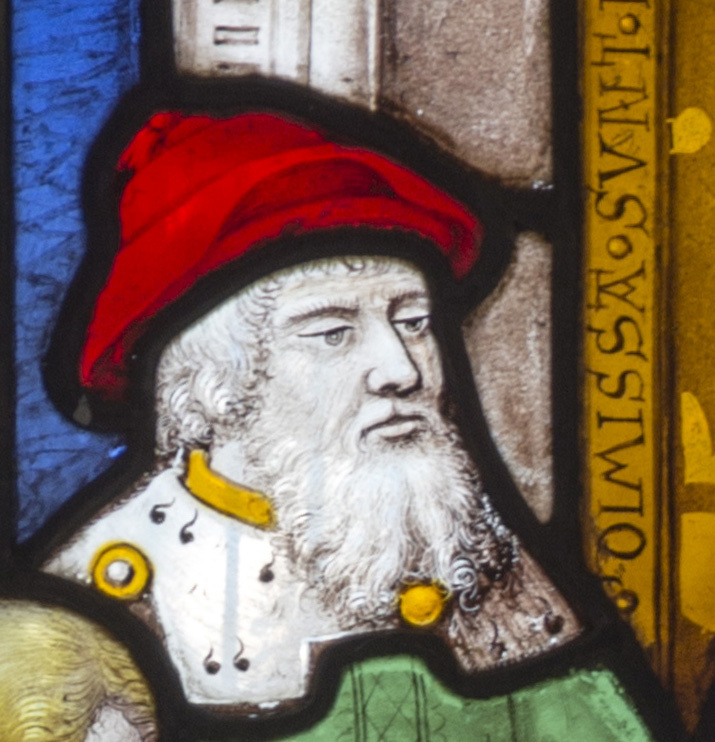 Stained glass windows came in to being in Medieval times as a means of educating the largely illiterate public about the Good News of the Bible through visual images. Helen’s window does an amazing job in encapsulating the various themes and messages that run through the Bible. It will be a great aid to teaching and a wonderful compliment to the Jesse artefact itself. The starting point for Helen’s design is the ‘centrality of Christ as God and man’. The dual aspects of Christ are explored through images and relationships connected with the five principal themes: Christ, Kingship, Prophecy, the Church and the Sacrament.